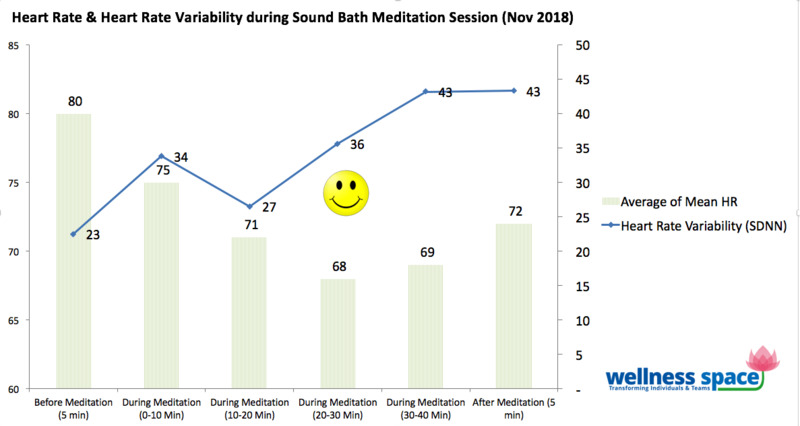 What happens to my heart rate and heart rate variability (HRV) during Sound Bath Meditation? For many years, we conduct Free Meditation @ Wellness Space (also known as Sound Bath Meditation using Singing Bowls, details here). From time to time, we do simple studies to understand how the body and the mind responds to such meditations. This article shares a case study of an individual before, during and after meditation with the focus on key parameters of our nervous system (heart rate, heart rate variability). Dr Chirag Zaveri, who comes regularly for the free meditation agreed to participate in this simple study and also consented when we asked if we could share his name on this short write-up. Thank you Dr Chiragbhai for supporting the Free Meditation @ Wellness Space and also sharing some insights when people ask questions after the meditation ! Dr Zaveri’s heart rate continued to decline as the meditation progressed and remained quite low even for 5 minutes after the meditation was completed. The heart rate variability (a physiological phenomenon denoting the variation in the time interval between heart beats. Details at the end of the article) continued to increase as the heart rate declined (positive change). The graph below shows heart rate every 5 minutes before, during (about 40 minutes, divided into each 10 minute segment) and after the meditation (for 5 minutes). From 80, the heart rate decreased to a minimum of 68 during minutes 20 to 30 and remained at 72 during the 5 minute measurement after the meditation was over. The heart rate variability increased during the meditation and remained high even after the meditation was completed. The meditation uses the sound vibrations of the Himalayan singing bowls and is conducted every full moon and new moon day at 7pm for 40 minutes. For those who are interested in more detailed perspective on heart rate, the visual below shows how it varied throughout the session. Case Study – What is Meditation? How can we measure it? HRV is a physiological phenomenon denoting the variation in the time interval between heartbeats. This interval is measured in milliseconds and is called the ‘R-R interval” or the “inter-beat interval”. It is important to understand this concept because a low HRV, i.e., less variability in the heart beats indicates that the body is under stress due to physiological reasons, exercise, or any other external stressor. Also important is the nature of the variation. Stress, anger, frustration, anxiety and other such negative emotions cause the variations to be chaotic. Positive emotions e.g. gratitude, love etc. lead to rhythmic and ordered variations. Note: The data was measured using Emwave Pro and analysed using Kubios Professional HRV Software at Wellness Space, Ahmedabad, India.